So many skiers, all members of Horsehead club set a new world record. The skiing run had a distance one nautical mile ( 1852 meters or 6080 feet ); only 145 of 154 skiers were remaining.The skiers have to remain erect during this run.The youngest skier Alexandria Seaton was just 12 years old. Organizers engaged the vessel named Eagle for towing. This feat got completed in the perfect weather conditions, ideal for the event with no wind or wave action for this incredible show. The towing vessel has the 3000 HP engine with a number of propellers to give extra thrust. 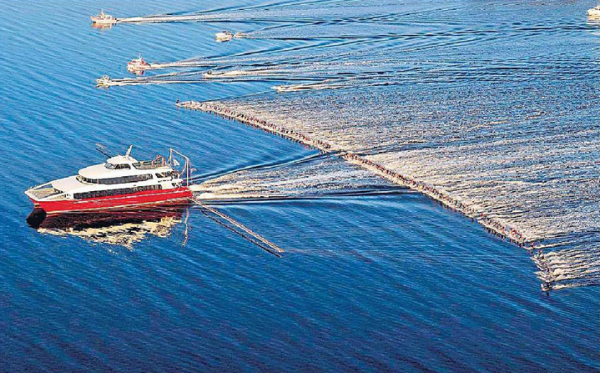 It was fitted with 308 feet long aluminium boom to prevent tangling of the skiers’ ropes. Guinness World Records executives were there to witness the show.